As you can imagine, Mom is always trying to make sure I stay warm and dry, especially during the winter. After all, we do live in Ohio, and it gets freezing cold outside. Not to mention Mom wants to keep my feet clean of all the salt and de-icing chemicals out there. Last year Mom tried all kinds of dog boots on me, without any real luck. They either were too hard to get on, slid around, or were not warm. My friends at Saltsox came to the rescue! They sent me two pairs of Saltsox Urban Booties to try. Two pairs, because Mom told them I was a size Medium, and they thought I would be a size Small since I’m a Cavalier King Charles Spaniel. They told Mom to use whichever one that didn’t fit as a giveaway on her Facebook Page. 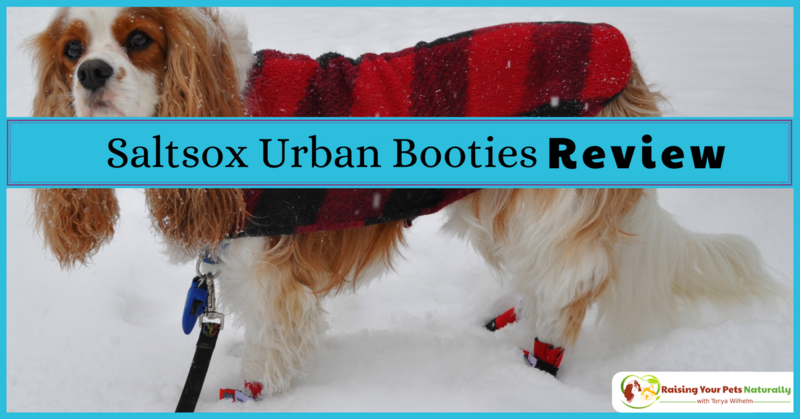 Mom and I choose the Ice Fire Red color of Saltsox Urban Dog Booties. When they arrived, they came in this cute packaging. Mom opened up both boxes, and sure enough, I was going to be a medium. You see, I am a big boy, at 27 lbs (not fat, mind you), and I have big club feet! Mom was very impressed with the lightness of the dog bootie. They were pretty easy to put on my feet and did not have any cumbersome zippers to snag in my furry toes. They slipped on my feet without any hassle, and Mom easily wrapped the attached velcro around my ankle to secure the boot. Right from the start Mom was happy with the way they fit my foot. To date, all my dog boots have not fit my feet, and had extra fabric in odd places. But not the form-fitting Saltsox Urban Booties; they hugged my foot quite comfortably. So off we went. Today was a perfect day to try my new dog boots because we are getting a big snowstorm with 14 inches coming our way. We went for a walk around the block, and the boots stayed on, did not slip around, gave me nice traction, and I was not weighed down by a bulky sole. They made it all the way home in the same place they started. When Mom took off my Saltsox Urban Booties, my feet were dry, the velcro did not grab my fur, and the boot felt dry, too. That’s pretty amazing. These high-performance dog booties feature a weatherproof design that will keep my paws warm, dry, and protected. The boot is made with a waterproof and breathable soft-shell and Cordura fabric so it will keep my feet warm and protected from the elements. Saltsox Urban Booties are a BIG WIN in my book. 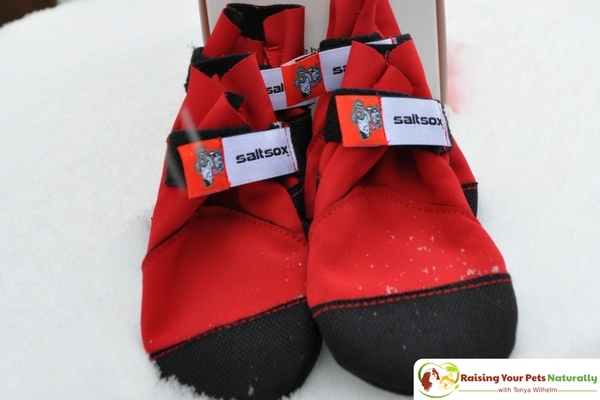 A big thank you to Saltsox for introducing us to your amazing dog boots. 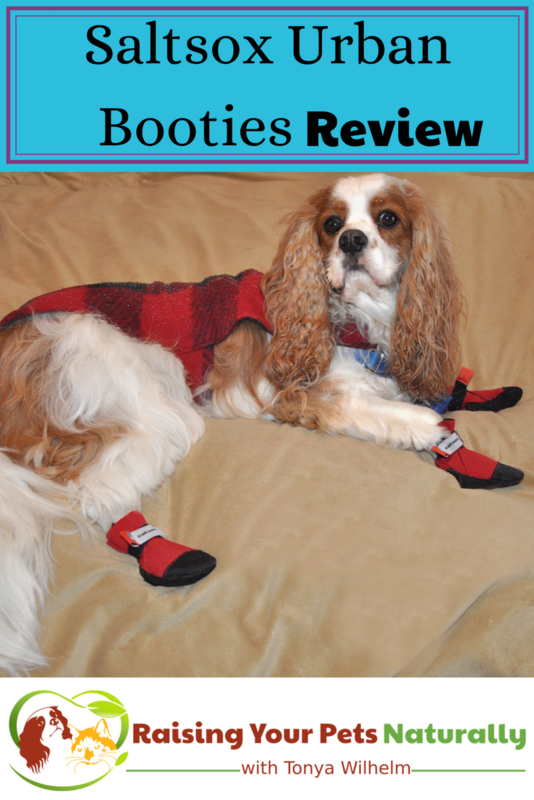 Have you tried dog boots? Tell me in the comments. 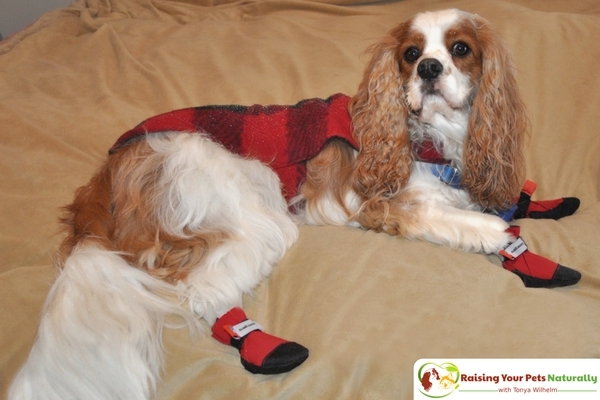 It’s been a couple of years since you made this post, just wanted to see if you still thought the saltsox were a good purchase and how your cavalier is liking them. Hi, Kiran. Yes, we still go to our Saltsox first for boots for winter walks. The red pair is still doing great, but we just received the teal ones. 🙂 Super cute!